Shinn Pond is the best place in the Fremont area to walk your dog! It offers long trails, big grassy areas and more! 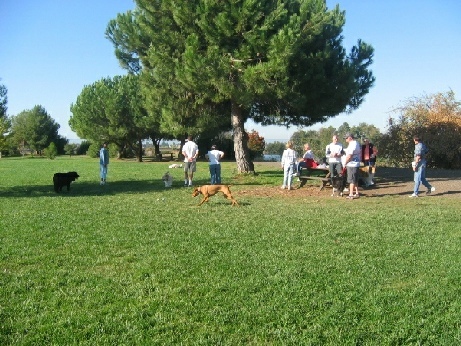 Although Shinn Pond is not an "Official" dog park, it is a favorite place of many dogs and their owners. Shinn Pond offers great amenities for dogs and owners alike. Shinn Pond is located in the town of Niles along side the Alameda Creek Regional Trail. The best parking is located at Niles Community Park at the corner of 3rd and H Streets. Shinn Pond is only a couple hundred yard walk west from there, along the levee. Alternative parking is located on School St.
Long trail for walking, jogging or cycling with our canine friends. Large grassy areas for the dogs to run around and play on. Large pond for dogs to swim in and cool off. Picnic benches in both sun and shade for social gatherings. Water for both doggies and people. Staring January 1st. 2013 grocery stores will no longer give out plastic bags. You will either need to bring your own or be charged $.10 per bag. 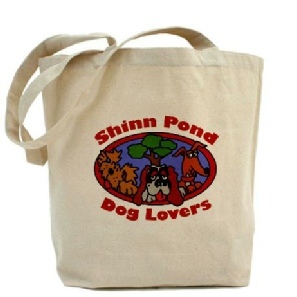 So how about a Shinn Pond Dog Lovers Grocery Tote Bag, 100% cotton canvas?